There are existing clinical data sets, but the pictures they contain are clinical images, taken in controlled conditions, often with a dermascope, which is a specialized medical instrument for taking pictures of the skin. Furthermore, getting access to medical datasets is very difficult, since patients have to have consented to have their data used in research and most have not. Even if they have, the researchers have to secure IRB approval for access to the images. Mary Sun is a medical student at the Icahn School of Medicine at Mount Sinai Medical Center in New York, but she’s also working remotely with teledermatology company First Derm on improving the company’s AI algorithms. She says a traditional clinical research approach doesn’t bring in anything near the scale needed for machine learning. 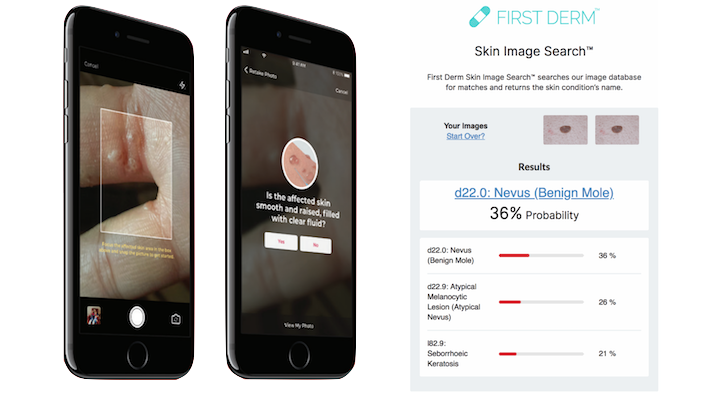 This is leading a number of companies like First Derm to create direct-to-consumer teledermatology or dermatology triage tools, in which patients consent to sharing their data in exchange for free access. Even companies like VisualDx, which have a robust dataset from years in the CDS space, have to balance patient privacy considerations. What most researchers and developers want is an AI that can look at pictures taken with a smartphone in a home environment. And smartphone camera pictures can look very different from one another, even if they’re of the same thing. Differences in angle, lighting and focus need to be accounted for. For dermatology, Sun and the team at First Derm have been working on ways of computer-treating the image to improve accuracy. Dermatologists today are especially aware of the risk of creating algorithms that only work with certain races of people, an easy and dangerous training bias to introduce. Even once a computer can make an apples to apples comparison between different lesions in different lightings taken with different smartphone cameras, most researchers don’t think it will be able to make a perfect diagnosis. One reason for that is that even human dermatologists disagree sometimes, especially in the absence of additional information. Ultimately, what researchers are hoping to create is a largely accurate algorithm that can help give piece of mind to people concerned about their skin — and possibly too embarrassed to seek other help. While there is a risk of giving false negatives that could endanger patients, there’s also no alternative. Patients who are concerned about their health, but not concerned enough to go to a doctor, are going to look somewhere.